On Circus Education. Circus combines the best of sport and art – it is physical skill-building in a non-competitive atmosphere. Circus crosses boundaries of language, culture, economics, and age – a remarkably agile and facilitative builder of community. Nutrition Assembly. Working with San Diego Unified School District's Food & Nutrition Department, Fern Street Circus has developed an entertaining and educational circus assembly which helps students build better nutrition habilts. Eat a Rainbow features three great circus acts introduced by host Clown (i.e., Professor) Otis along with special guest Heartman. It's a great assembly for any school. After-School Circus Program at Mid-City Gym in City Heights. City of San Diego Park & Recreation Department has hosted our programs since 1993. Students are trained by skilled instructors and apprentices perform in the ring with professionals. Ages of students range from six year olds to teens; our bi-lingual staff works with parents to support the effort. Circus Youth Apprentice Program. An important component of our on-going After-School Circus Program, the Apprentice Program focuses on enhanced training and act creation for the most determined, gotta-have it students. Our pilot Apprentice group convened in mid-August 2015 with performances September - December as part of the professional Fern Street Circus show: City Heights to Carlsbad, Chollas View to U.C.S.D. (the La Jolla Playhouse Without Walls Festival). Other Instructional Programs. Fern Street Circus creates customized circus learning programs for schools and community organizations. We start with juggling, tumbling, and clowning, adding, for example, elements of literacy, conditioning, or nutrition to curricula. Coming in Spring 2016: a circus assembly for schools and community groups. Students learn excellent hand-eye coordination through juggling a variety of fun objects! 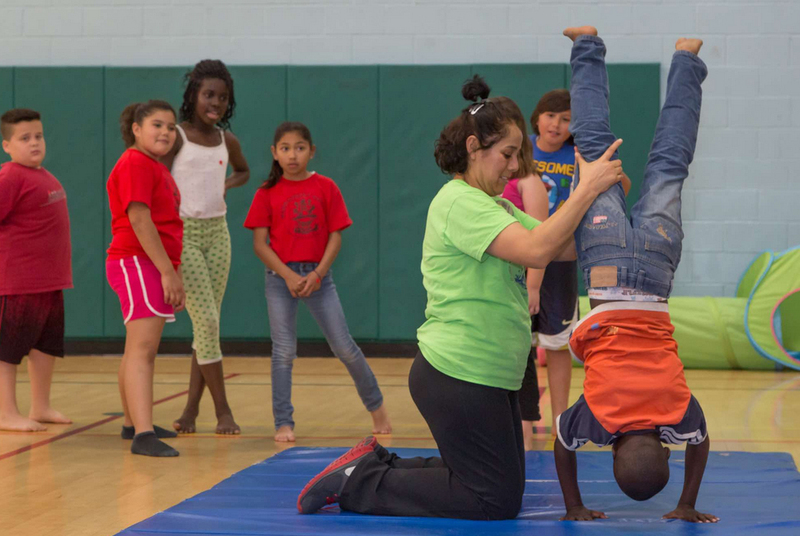 Our circus coaches teach balance, cartwheels, hand stands, flips and even more to come! Learn to jump and land in style from our mini trampoline!